For those of you who don’t know Jenny and Tyler are a folk/pop duo from Delaware who currently live and tour out of Nashville, TN. I first heard of Jenny and Tyler when they opened for the band that used to play at my church at a concert in my town. I had never heard of them before, even though they are from Delaware and went to University of Delaware. As soon as the concert was over I had to buy their album that was on sale there because they were that good! Their music was simple, yet different and seemed real, not to mention they had killer harmonies!! The first CD I ever bought of theirs was called A Prelude, and although they are both Christians, their music wasn’t the typical Christian music I had heard before (nothing against Christian music, it can just get a little boring after a while.) Nothing was boring about this album though and from then on I was a fan! I didn’t know it until I was already involved but I am involved in Baptist Student Ministry at University of Delaware and it turns out that not only did they go to UD, but they were involved in this exact ministry! In fact they first met each other on the bus ride from the BSM house to church! Last year another ministry on campus held Justice Week which was a week long event to raise awareness of human trafficking on campus and at the end of the week there was a big closing event which Jenny and Tyler performed at. Until then I had no idea that they were involved in efforts to raise awareness of human trafficking. But in fact they are VERY involved with cause and it is something that is very close to their hearts. Which is why on November 12th they will be releasing a new covers EP entitled ‘For Freedom: A Covers EP’. This album consists of covers of songs that are some of Jenny and Tyler’s favorites including: The Scientist by Coldplay, The Sound of Silence by Simon and Garfunkel, I Still Haven’t Found What I’m Looking For by U2 and many others! AND THE BEST PART IS all of the proceeds from the sale of the EP go directly to organizations helping to bring an end to human trafficking around the world! The whole album is excellent as there is a Jenny and Tyler spin on each of these classic songs that makes it seem like you are listening to an original album (if you’re not sure exactly what at “Jenny and Tyler spin” is then I would encourage you to listen to some of their other albums on Spotify, they’re great, you’ll love them!) It’s hard to pick favorites, but if I had to I would say The Scientist and I Still Haven’t Found What I’m Looking For are my personal favorites. 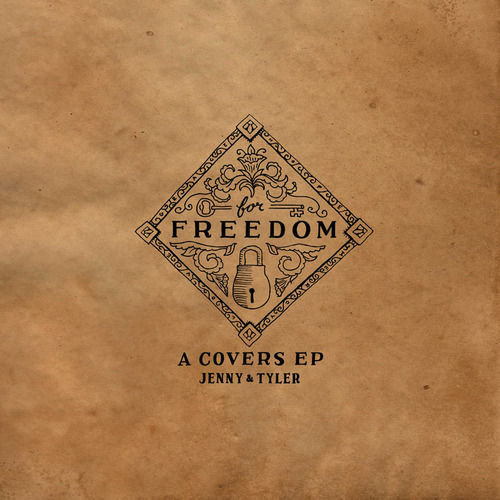 I love the original versions and J&T don’t disappoint with their folky covers. The Scientist features the usual killer harmonies of Jenny Somers accompanied by a soft mandolin in the beginning and then as the song progresses a violin/strings section, rhythm section and background vocals are added. I really like the more acoustic approach to this song it makes the already slow, chilling lyrics that much more powerful. This rendition gives me chills every time I hear it! I Still Haven’t Found What I’m Looking For again features Jenny Somers great harmonies paired with Tyler’s melodies. Added to their vocals is a virtual choir made up of entries sent in by fans, which sounds excellent and is such a cool feature! This virtual choir really adds to the production value of the song especially when you think of the fact that it is made up of hundreds of separate entries that were then melded into one choir. It sounds like a real choir was their in the room with them as they were recording this track! The track also features the vocal stylings of Sara Groves, which definitely add to the song’s overall richness! This entry was posted in Hear it: Music, Media, Posts: From Me to You and tagged For Freedom, Human trafficking, Jenny and Tyler, review, slavery. Bookmark the permalink.